Former Formula 1 driver Giedo van der Garde has switched to endurance racing after signing a contract with JOTA Sport LMP2 team. 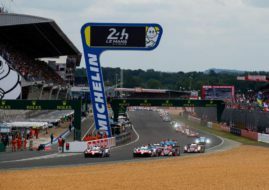 The 30-year-old Dutchman will compete in full European Le Mans series and will make a debut at the prestigious 24 Hours of Le Mans race, which was van der Garde’s lifelong ambition. “I will drive at highest level of motorsport again, but this time I will have a chance to win what was impossible with Caterham in Formula 1. To win 24 Hours of Le Mans is not just my dream, that’s my goal. I am happy to sign for established and proven team like JOTA Sport, so I hope this will be enjoyable year for me and for the team,” said van der Garde. In addition to the ELMS season and Le Mans, van der Garde will also compete at the second FIA World Endurance Championship round at Spa in May, sharing the Gibson 015S-Nissan with Simon Dolan and Jake Dennis at the circuit where the team has won two previous LMP2 class races in 2012 and 2015. Van der Garde will shortly get his first seat time in the Jota Sport car ahead of the official ELMS test at Paul Ricard on 22nd and 23rd of March.